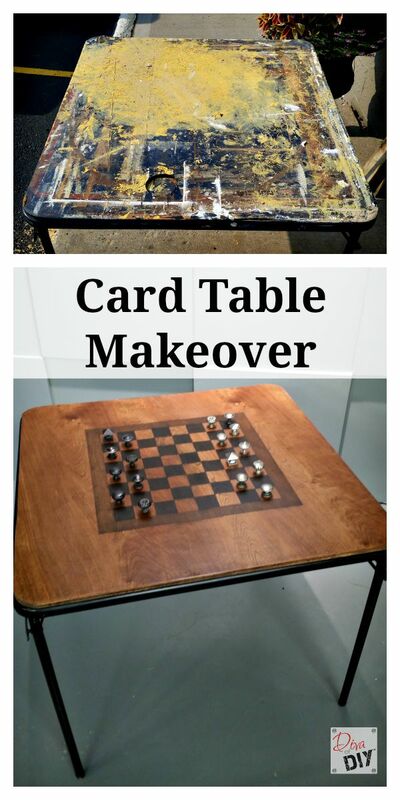 This card table makeover project may seriously be one of my favorite “trash to treasure” transformations to date and that my friends is saying a lot! 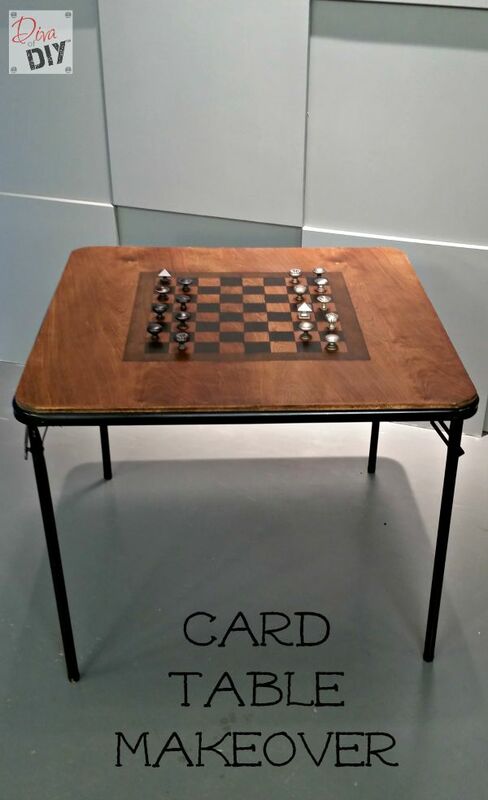 This card table was seriously minutes from the trash pile. 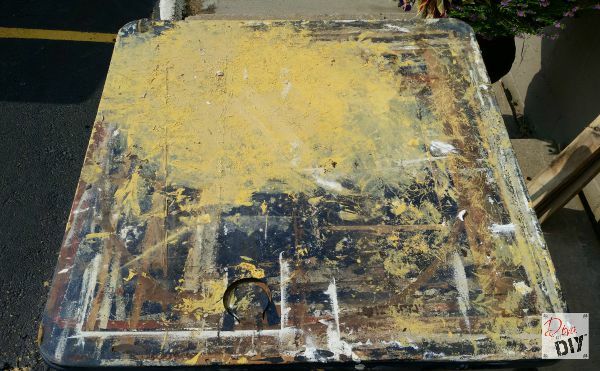 It had so many layers of plaster and paint on it from years of being used as a prep table on my job sites and then, to top it off, I cut through the vinyl top with a circle cutter <don’t even ask. lol>. You can see how warped the top was. 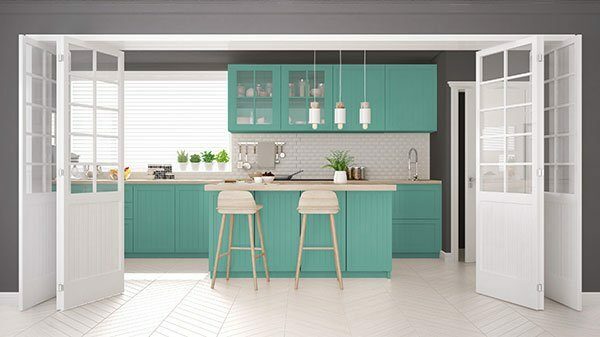 It was just 1/8″ masonite so it once the vinyl cover ws damaged, it didn’t stand much of a chance against water, wallpaper paste, plaster or wet paint. I decided to go ahead and remove the top and see what I had to work with. 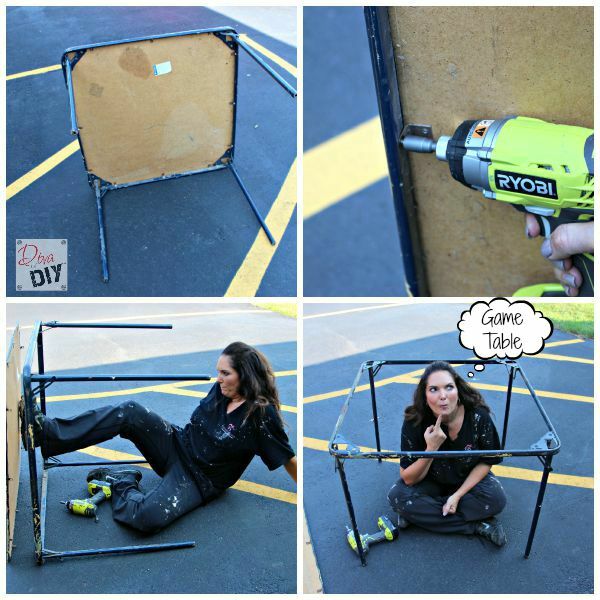 I used my Ryobi drill with a socket attachment to remove the screws holding the top to the frame. It was no surprise that the top was fused on to the frame so I had to use a little muscle to remove it. It didn’t take long to see there was no saving the top but…the frame…well I think I may have an idea!!! Let’s make a game table. 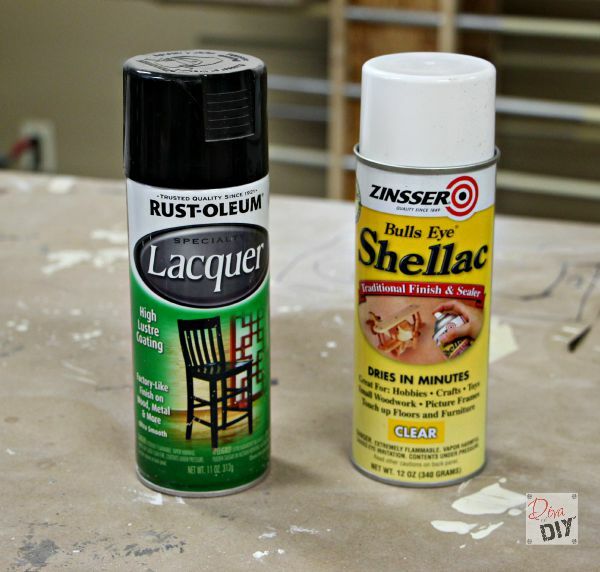 Spot-prime rust spots with clear Shellac. Let dry. Repeat. Once you have treated the rust, you are ready to paint it in any color. I chose black high gloss lacquer. Spray light even coats letting it dry in between coats. While the lacquer was drying, I started working on the table top. I was super lucky and had a piece of 1/2″ birch plywood left over from another project that measured 33 1/2″ x 48″. 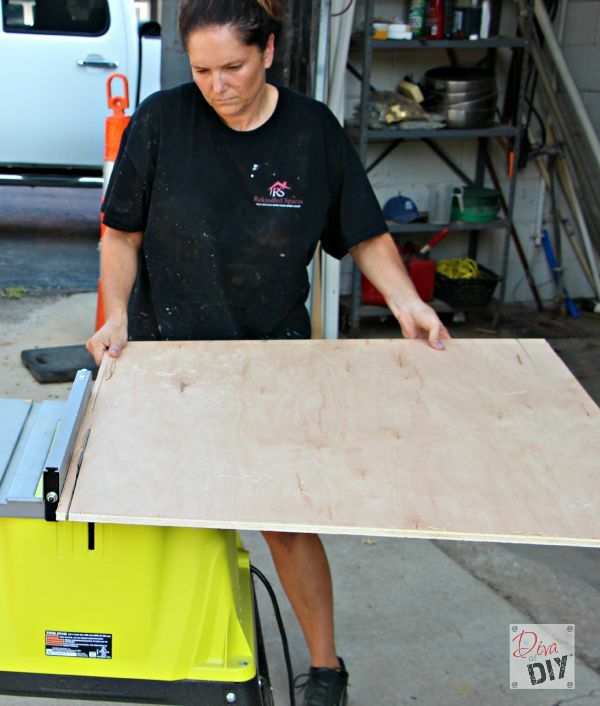 I measured the opening on the frame (and double-checked it by measuring the table top I removed) and needed my new top to be 33″ x 33″ so I used my Ryobi table saw and took 1/2″ off one side and 15″ off the other side to get a 33″ square. Diva Tip: If you don’t have a table saw, you can have the hardware store cut the plywood square. Next, find a can that has the same radius as your table corner and use it as a template to mark your corners. 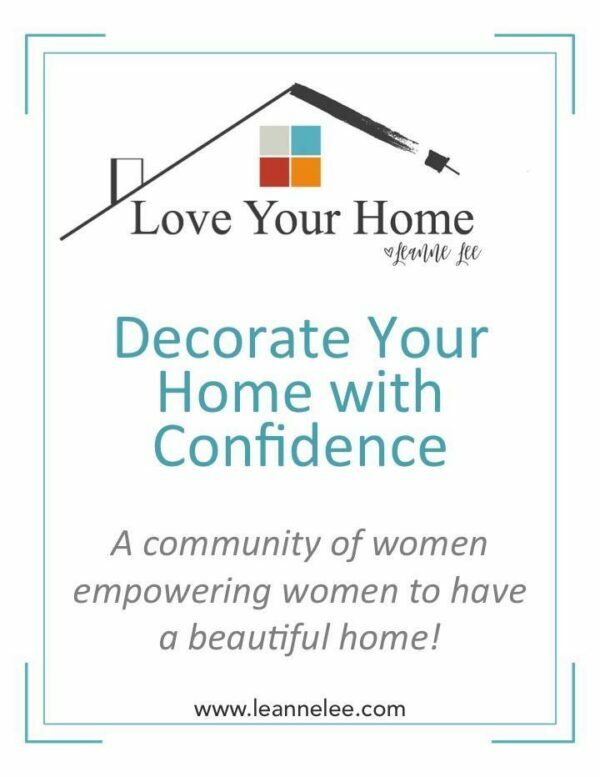 Diva Tip: You could also lay the old table top on top of the plywood square to mark the corners but my top was too warped to get an accurate measurement. Using your Ryobi Jigsaw, follow the line you have drawn on the board. Repeat on other 3 sides. Next, take the Ryobi Multi-use tool with the sanding attachment and level off any imperfections on the corners. Lightly run the sanding tool all the way around the edge of the plywood to soften the edge. Now you are ready to stain. 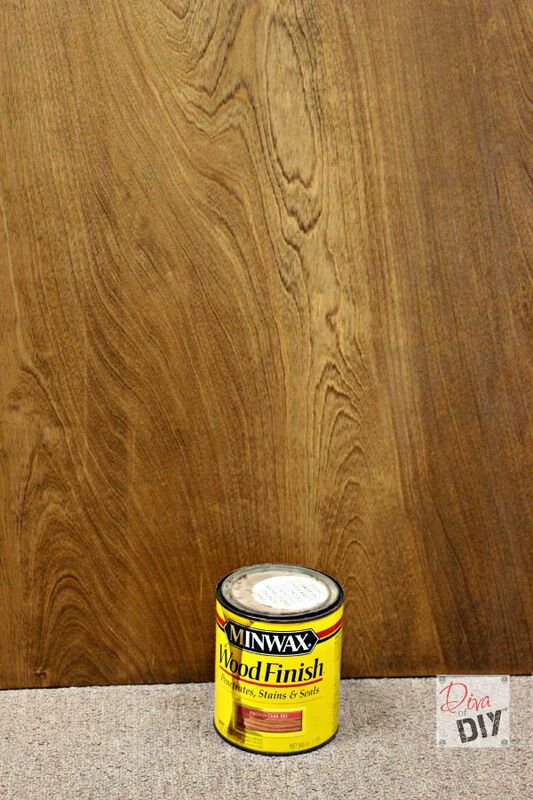 I stained my PureBond Birch Plywood top with Minwax Penetrating Stain in the color: Provencial. Let dry. 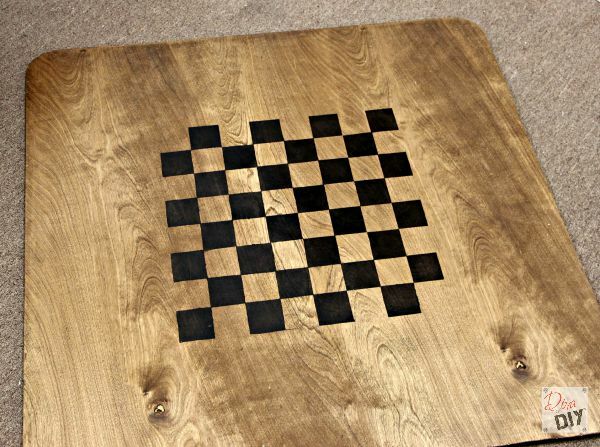 I decided to make the checkerboard 16″ x 16″. 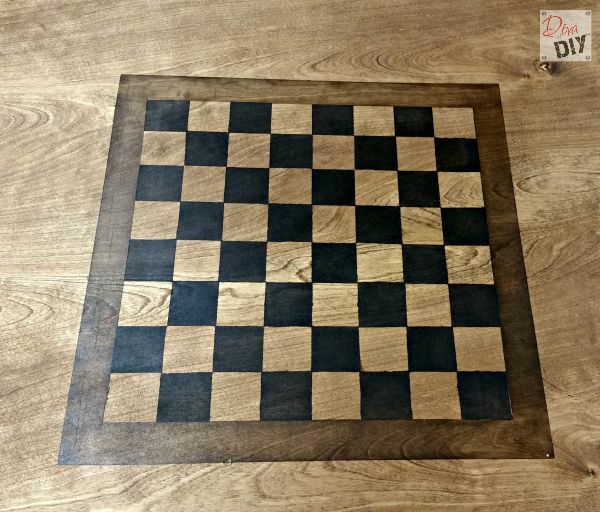 A checkerboard has 8 sections so each section needed to be 2″ wide. 1) Find center on your table. 2) Measure 8″ out from center each direction to get your 16″ center square. 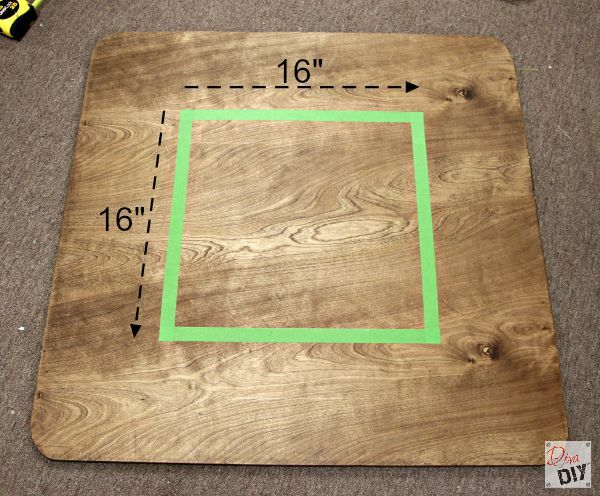 3) Using a tape measure or ruler, measure and mark every 2″ on all 4 sides of the 16″ square. 4) Tape off every other section in one direction using Frog Tape or another low-tack painters tape. 5) Now tape off every other section going the other direction. 6) Now here is a trick to get the perfect alternating squares for the checkerboard… find the squares where the tape overlaps. These are the squares your are going to cut out. Diva Tip: Use a straight edge such as a ruler to make cutting the tape squares easier. 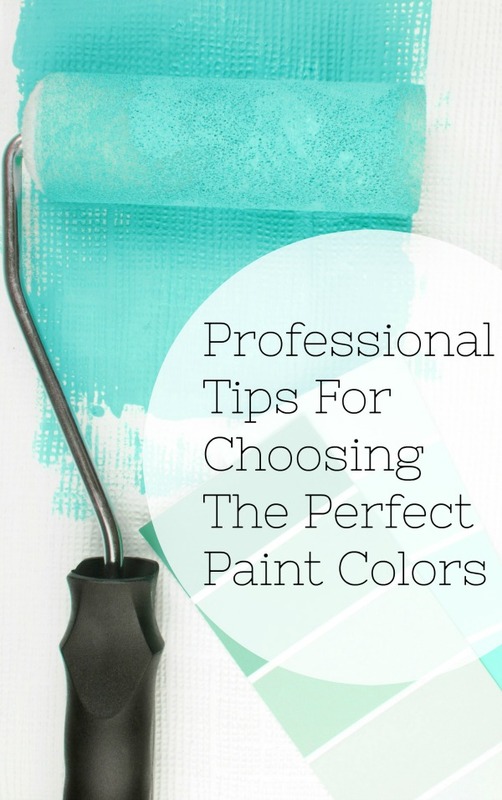 7) Burnish the tape with a credit card or end of a paint stick to keep stain from bleeding under the tape. 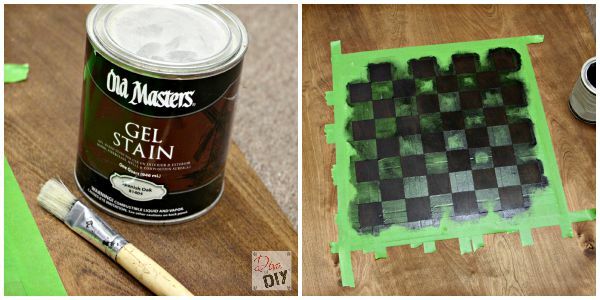 8) Using a medium artist brush, apply gel stain in the open spots on the checkerboard. I used Old Masters Spanish Oak Gel Stain for this step. Let dry. At this point you have a decision to make…leave it like this or take it to the next level. If you choose to keep going, follow steps 10 & 14. 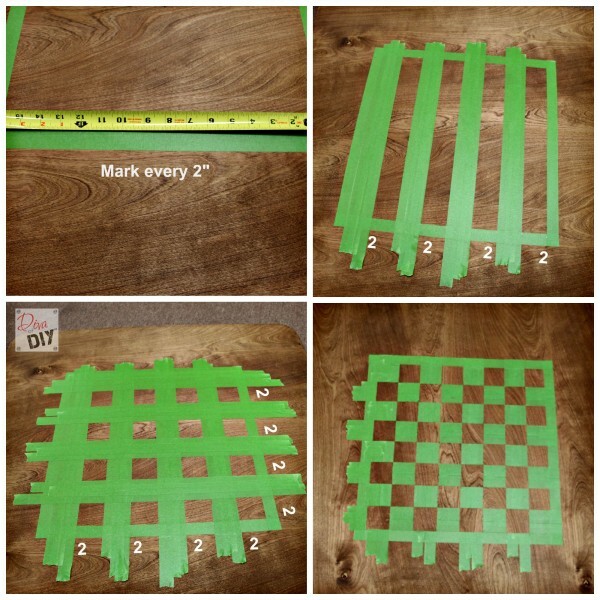 10) Tape off the edge of the checkerboard using Frog Tape’s delicate surface tape. 11) Create a border using Frog Tape or other low-tack painter’s tape. I made mine 1 1/2″ wide. 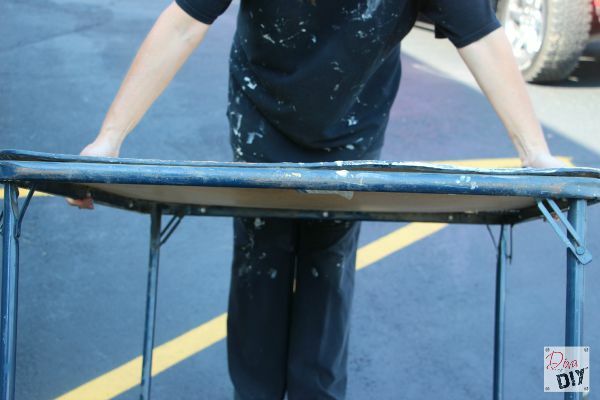 13) Using another medium artist brush, apply stain in outer border area. I used Old Master’s Dark Walnut Gel Stain. Let Dry. 15) Spray with Polyurethane. Let dry. Lightly buff. Repeat with another coat of polyurethane. 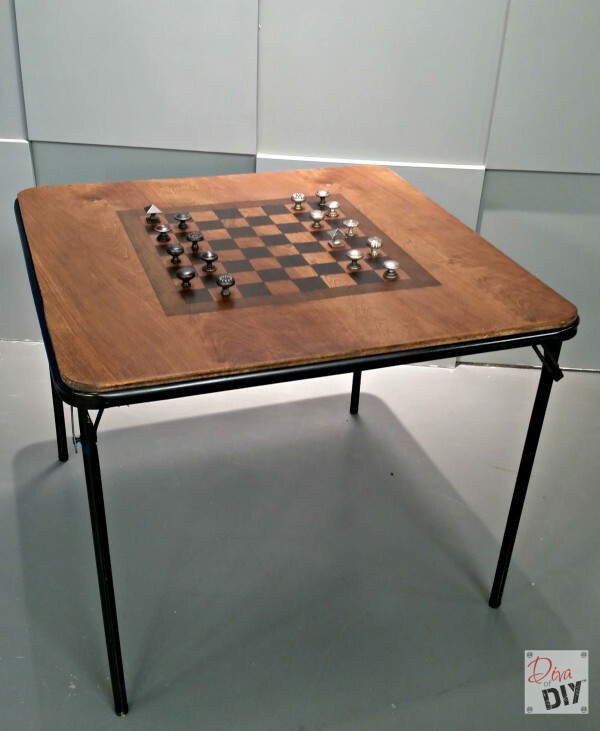 I added a re-purposing flair by using salvaged cabinet door knobs for my checker pieces. I also cut some 1.5″ x 1.5″ wood squares that I stained to match the table to slide under the cabinet knob when my opponent yells “King Me”.